Mail.app in iOS7 brought swiping cells to the inbox. 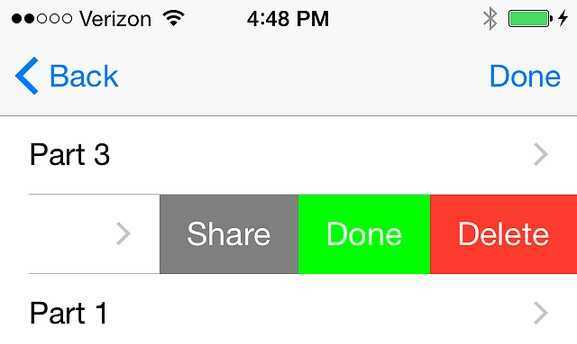 The iOS8 beta added a 3rd button to it. Apple has also introduced an API to assist with creating this effect: UITableViewRowAction. Prior to this, I used SWTableViewCell. I’ve had to add some workarounds to deal with this for now. I’ve filed rdar://17969970 against this. For now, this is how I’m handling by checking if I’m already in edit mode when I build out the actions array. This isn’t ideal at all. I don’t even want to be able to delete when I’m in edit mode, just reorder. Apologies for switching back to obj-c. The delegate I’m working in is older. This post and the Radar helped me collect my thoughts to post on Stack. I’ve been afraid of backlash or Noob. Time to get over it.